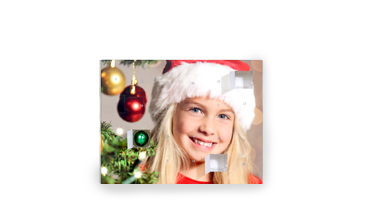 Create your own picture Advent calendar, without glue or scissors. 24 little doors conceal festively wrapped chocolate balls. A beautiful reminisce every day of Advent! The sweetest Advent Calendar with no sugar and no sweeteners. Lovingly selected and surprising. Now available in sizes A4 and A3. Whether for grandma, father, a friend, colleague or neighbour: the loved ones who only deserve the best. The kinder® Advent calendar with your favourite picture of your pet, friend, family or last outing - now in two sizes - that's simply unbeatable!